^ 1.0 1.1 1.2 1.3 Schneider, Jean. Interactive Extra-solar Planets Catalog. The Extrasolar Planets Encyclopedia. 2011-09-10 [2018-10-28]. ^ My God, it's full of planets! They should have sent a poet. (新闻稿). Planetary Habitability Laboratory, University of Puerto Rico at Arecibo. 2012-01-03 [2013-01-04]. ^ 4.0 4.1 Claven, Whitney. Billions and Billions of Planets. NASA. 2013-01-03 [2013-01-03]. ^ 6.0 6.1 Cassan, A; Kubas, D.; Beaulieu, J.-P.; Dominik, M.; Horne, K.; Greenhill, J.; Wambsganss, J.; Menzies, J.; Williams, A. One or more bound planets per Milky Way star from microlensing observations. Nature. 2012-01-11, 481 (7380): 167–169 [2012-01-11]. Bibcode:2012Natur.481..167C. PMID 22237108. arXiv:1202.0903. doi:10.1038/nature10684. ^ Planet Population is Plentiful. ESO Press Release. [2012-01-13]. ^ Wall, Mike. 160 Billion Alien Planets May Exist in Our Milky WayGalaxy. Space.com（英语：Space.com）. 2012-01-11 [2012-01-11]. ^ Nomads of the Galaxy, Louis E. Strigari, Matteo Barnabe, Philip J. Marshall, Roger D. Blandford; estimates 700 objects >10−6 Solar masses (≈a Mars mass) per main sequence star between 0.08 and 1 Solar mass, of which there are billions in the Milky Way. ^ 11.0 11.1 11.2 11.3 Wolszczan, A.; Frail, D. A. A planetary system around the millisecond pulsar PSR1257+12. Nature. 1992, 355: 145 – 147. ^ William J. Borucki, for the Kepler Team. Characteristics of Kepler Planetary Candidates Based on the First Data Set: The Majority are Found to be Neptune-Size and Smaller. 23 July 2010. arXiv:1012.0707v2 [astro-ph.SR]. ^ Johnson, Michele. NASA Discovers First Earth-size Planets Beyond Our Solar System. NASA. 2011-12-20 [2011-12-20]. ^ Hand, Eric. Kepler discovers first Earth-sized exoplanets. Nature. 2011-12-20. doi:10.1038/nature.2011.9688. ^ Overbye, Dennis. Two Earth-Size Planets Are Discovered. New York Times. 2011-12-20 [2011-12-21]. ^ Terrestrial Planet Finder science goals: Detecting signs of life. Terrestrial Planet Finder. JPL/NASA. [2006-07-21]. （原始内容存档于2008-02-08）. ^ Moskowitz, Clara. Most Earth-Like Alien Planet Possibly Found. Space.com（英语：Space.com）. 2013-01-09 [2013-01-09]. ^ Campbell, B.; Walker, G. A. H.; Yang, S. A search for substellar companions to solar-type stars. Astrophysical Journal, Part 1. 1988, 331: 902 – 921. ^ Lawton, A. T.; Wright, P. A planetary system for Gamma Cephei?. British Interplanetary Society, Journal. 1989, 42: 335 – 336. ^ Walker, G. A. H.; Bohlender, D. A.; Walker, A. R.; Irwin, A. W.; Yang, S. L. S.; Larson, A. Gamma Cephei - Rotation or planetary companion?. Astrophysical Journal, Part 2 - Letters. 1992, 396 (2): L91 – L94. ^ Artie P. Hatzes; William D. Cochran; Michael Endl; Barbara McArthur; Diane B. Paulson; Gordon A. H. Walker; Bruce Campbell; Stephenson Yang. A Planetary Companion to Gamma Cephei A. The Astrophysical Journal. 2003, 599: 1383 – 1394. ^ Bailes, M.; Lyne, A.G.; Shemar, S.L. A planet orbiting the neutron star PSR1829-10. Nature. 1991, 352: 311 – 313. ^ Lyne, A.G.; Bailes, M. No planet orbiting PS R1829-10. Nature. 1992, 355 (6357): 213. ^ 26.0 26.1 Mayor, Michel; Queloz, Didier. A Jupiter-mass companion to a solar-type star. Nature. 1995, 378: 355 – 359. ^ Perryman, Michael. The Exoplanet Handbook. Cambridge University Press. 2011: 149. ISBN 978-0-521-76559-6. ^ F. Pepe, C. Lovis, D. Segransan et.al. The HARPS search for Earth-like planets in the habitable zone. Astronomy & Astrophysics. 2011, 534: A58. Bibcode:2011A&A...534A..58P. arXiv:1108.3447. doi:10.1051/0004-6361/201117055. ^ http://www.scientificcomputing.com/news-DS-Planet-Hunting-Finding-Earth-like-Planets-071910.aspx 页面存档备份，存于互联网档案馆 "Planet Hunting: Finding Earth-like Planets"
^ Jack J. Lissauer, Daniel C. Fabrycky, Eric B. Ford, et.al. A closely packed system of low-mass, low-density planets transiting Kepler-11. Nature. 2011, 470 (7332): 53. Bibcode:2011Natur.470...53L. arXiv:1102.0291. doi:10.1038/nature09760. （原始内容存档于2011-11-30）. ^ Townsend, Rich. The Search for Extrasolar Planets (Lecture). Department of Physics & Astronomy, Astrophysics Group, University College, London. 2003-01-27 [2006年9月10日]. （原始内容存档于2005年9月15日）. ^ 33.0 33.1 J.S. Greaves; M.C. Wyatt; W.S. Holland; W.F.R. Dent. The debris disk around tau Ceti: a massive analogue to the Kuiper Belt. Monthly Notices of the Royal Astronomical Society. 2004, 351: L54 – L58. ^ J.S. Greaves; W.S. Holland; M.C. Wyatt; W.R.F. Dent; E.I. Robson; I.M. Coulson; T. Jenness; G.H. Moriarty-Schieven; G.R. Davis; H.M. Butner; W.K. Gear; C. Dominik; H. J. Walker. Structure in the Epsilon Eridani Debris Disk. The Astrophysical Journal. 2005, 619: L187 – L190. ^ G. Chauvin; A.M. Lagrange; C. Dumas; B. Zuckerman; D. Mouillet; I. Song; J.-L. Beuzit; P. Lowrance. A giant planet candidate near a young brown dwarf. Astronomy & Astrophysics. 2004, 425: L29 – L32. ^ Yes, it is the Image of an Exoplanet (Press Release). 歐洲南天文臺網頁. 2005年4月30日 [2006年9月10日]. （原始内容存档于2005年4月30日）. ^ R. Neuhauser; E. W. Guenther; G. Wuchterl; M. Mugrauer; A. Bedalov; P.H. Hauschildt. Evidence for a co-moving sub-stellar companion of GQ Lup. Astronomy & Astrophysics. 2005, 435: L13 – L16. ^ Is this a Brown Dwarf or an Exoplanet?. 歐洲南天文臺網頁. 2005年4月7日 [2006年7月4日]. （原始内容存档于2006年6月15日）. ^ M. Janson; W. Brandner; T. Henning; H. Zinnecker. Early ComeOn+ adaptive optics observation of GQ Lupi and its substellar companion. Astronomy & Astrophysics. 2005, 453: 609 – 614. ^ Planetary Society charges administration with blurring its vision for space exploration. 行星學會網頁. 2006-02-06 [2006年7月17日]. ^ House Subcommitte Helps Save Our Science. 行星學會網頁. 2006-06-14 [2006年9月12日]. ^ Staff writers. Nasa launches Earth hunter probe. BBC News. 2009-03-07 [2009-03-14]. ^ R. R. Brit. Why Planets Will Never Be Defined. Space.com（英语：Space.com）. 2006 [2008-02-13]. ^ R.R. Brit. Why Planets Will Never Be Defined. Space.com. 2006 [2010-04-08] （英语）. 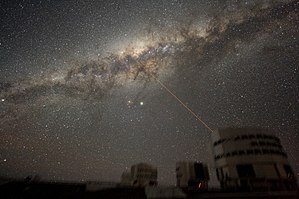 ^ Working Group On Extrasolar Planets (WGESP) Of The International Astronomical Union. IAU. 2001 [2010-04-08]. （原始内容存档于2006-09-16） （英语）. ^ Bonfils, X.; Forveille, T.; Delfosse, X.; et.al. The HARPS search for southern extra-solar planets VI: A Neptune-mass planet around the nearby M dwarf Gl 581. Astronomy & Astrophysics. 2005, 443: L15 – L18. ^ Fourteen Times the Earth - ESO HARPS Instrument Discovers Smallest Ever Extra-Solar Planet (News Release). 歐洲南天文臺網頁. 2004年8月25日 [2006年5月7日]. （原始内容存档于2006年10月25日）. ^ Planets Table. Catalog of Nearby Exoplanets. [2009-06-02]. ^ John Nobile Wilford. New Planet Detected Around a Star 15 Light Years Away. The New York Times. 2001. （原始内容存档于2007-07-06）. ^ Blake Edgar, Megan Watzke, Carol Rasmussen. Multiple planets discovered around Upsilon Andromedae. Extrasolar planets. 1999,. 415, 617, 303: 338 – 6747, 495 – 7463, 497 – 8611. ^ Henry, G. W.; Marcy, G. W.; Butler, R. P.; Vogt, S. S. A Transiting "51 Peg-like" Planet. The Astrophysical Journal Letters. 2000, 529: L41 – L44. ^ Charbonneau, D.; Brown, T.; Noyes, R.; Gilliland, R. Detection of an Extrasolar Planet Atmosphere. The Astrophysical Journal. 2002, 568: 377 – 384. ^ Sigurdsson, S.; Richer, H.B. ; Hansen, B.M. ; Stairs I.H. ; Thorsett, S.E. A Young White Dwarf Companion to Pulsar B1620-26: Evidence for Early Planet Formation. Science. 2003, 301 (5630): 193 – 196. ^ Fourteen Times the Earth - ESO HARPS Instrument Discovers Smallest Ever Extra-Solar Planet. ESO website. [2006-05-07]. （原始内容存档于2006-10-25）. ^ Extrasolar Planets Encyclopaedia.. [2010-03-25]. （原始内容存档于2011-10-06） （英语）. ^ The Planetary Mass Companion 2MASS 1207-3932B: Temperature, Mass, and Evidence for an Edge-on Disk, Subhanjoy Mohanty, Ray Jayawardhana, Nuria Huelamo, and Eric Mamajek, Astrophysical Journal 657, #2 (March 2007), pp. 1064–1091. Bibcode: 2007ApJ...657.1064M doi:10.1086/510877. ^ Eugenio J. Rivera; Jack J. Lissauer; R. Paul Butler; Geoffrey W. Marcy; Steven S. Vogt; Debra A. Fischer; Timothy M. Brown; Gregory Laughlin; Gregory W. Henry. A 7.5 Me Planet Orbiting the Nearby Star GJ 876. The Astrophysical Journal. 2005, 634: 625 – 640. ^ Sato, B.; Fischer, D.; Henry, G.; Laughlin, G.; Butler, R.; Marcy, G.; Vogt, S.; Bodenheimer, P.; Ida, S.; Toyota, E.; Wolf, A.; Valenti, J.; Boyd, L.; Johnson, J.; Wright, J.; Ammons, M.; Robinson, S.; Strader, J.; McCarthy, C.; Tah, K.; Minniti, D. The N2K Consortium II: A Transiting Hot Saturn around HD 149026 with a Large Dense Core. The Astrophysical Journal. 2005, 633: 465 – 473. ^ Konacki, M. An extrasolar giant planet in a close triple-star system. Nature. 2005, 436: 230 – 233. ^ NASA Scientist Finds World With Triple Sunsets (News Release). 噴射推進實驗室網頁. 2005年7月13日 [2006年5月7日]. ^ Discovery of OGLE 2005-BLG-390Lb, the first cool rocky/icy exoplanet. 2006-01-25. .
^ Kiwis help discover new planet. One News. 2006年1月26日 [2006年5月7日]. 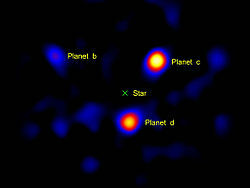 ^ Strange New Planet Baffles Astronomers (新聞公佈). 哈佛－史密松天文物理中心. 2006年9月14日 [2006年9月14日]. （原始内容存档于2006年10月6日）. ^ Tiniest exoplanet found. Nature Publishing Group. 2009-02-03 [2009-02-07]. ^ Notes for planet CoRoT-7 b. [2009-03-17]. ^ COROT discovers smallest exoplanet yet, with a surface to walk on. European Space Agency. 2009-02-03 [2009-02-04]. ^ New discoveries suggest low-mass planets are common around nearby stars. Astronomy.com. 2009-12-14 [2009-12-21]. ^ Astronomers find super-Earth using amateur, off-the-shelf technology. Astronomy.com. 2009-12-16 [2009-12-21]. ^ Nancy Atkinson. Kepler Discovers Multi-Planet System. Universe Today. 2010-08-26 [2011-01-13]. ^ SIMBAD query result. [2010-11-19]. ^ Notes for star HIP 13044. [2010-11-19]. ^ A Giant Planet Around a Metal-Poor Star of Extragalactic Origin. [2010-11-19]. ^ Minogue, Kristen. Alien Planet May Have Come From Another Galaxy. ScienceNOW (American Association for the Advancement of Science). 2010-11-18 [2010-11-19]. ISSN 1947-8062. （原始内容存档于2010-11-19）. ^ Than, Ker. New Planet Discovered: First Spotted Outside Our Galaxy. NationalGeographic.com. National Geographic Society. 2010-11-18 [2010-11-19]. ^ Wall, Mike. First Alien Planet From Another Galaxy Discovered. Space.com. TechMediaNetwork. 2010-11-18 [2010-11-19]. ^ Bowdler, Neil. 'Alien' planet detected circling dying star. BBC.co.uk. BBC News. 2010-11-18 [2010-11-19]. ^ Spotts, Pete. Found: a planet not from the Milky Way, circling a star in its death throes. CSMonitor.com. Christian Science Monitor. 2010-11-18 [2010-11-19]. ^ Matson, John. Extragalactic Expat: Newfound Exoplanet Likely Came from Another Galaxy. ScientificAmerican.com. Scientific American. 2010-11-18 [2010-11-19]. ^ Santini, Jean-Louis. First glimpse of a planet from another galaxy. google.com. Agence France-Presse. AFP. 2010-11-18 [2010-11-19]. ^ Jones, M. I.; Jenkins, J. S. No evidence of the planet orbiting the extremely metal-poor extragalactic star HIP 13044. Astronomy & Astrophysics. 2014, 562. Bibcode:2014A&A...562A.129J. arXiv:1401.0517. doi:10.1051/0004-6361/201322132. ^ NASA Finds Earth-size Planet Candidates in Habitable Zone, Six Planet System. NASA. 2011-02-02 [2011-02-02]. ^ Overbye, Dennis. Kepler Planet Hunter Finds 1,200 Possibilities. New York Times. 2011-02-02 [2011-02-02]. ^ Batista, V.; Gould, A. MOA-2009-BLG-387Lb: A massive planet orbiting an M dwarf. Astronomy and Astrophysics (欧洲南方天文台). 2011-02-21. arXiv:1102.0558. ^ NASA Discovers First Earth-size Planets Beyond Our Solar System. NASA. 2011-12-20 [2011-12-20]. ^ Than, Ker. Oldest Alien Planets Found—Born at Dawn of Universe. National Geographic Daily News. National Geographic. 2012-03-26 [2012-03-29]. ^ Johnson, Michele; Harrington, J.D. NASA's Kepler Discovers Multiple Planets Orbiting a Pair of Stars. NASA Mission News. NASA. 2012-08-28 [2012-08-29].